(Nanowerk Spotlight) Biomineralization is the formation of inorganic materials in a biological environment, as it is found in bones, teeth and shells. Certain biominerals, mainly composed of calcium phosphates (CaPs), are also often associated with pathogeneses of tissues, such as breast cancers, osteoarthritis, and vascular calcification. Many ions, such as magnesium (Mg2+), strontium (Sr2+), fluoride (F-), and carbonate (CO32-), chloride (Cl-), sodium (Na+), as well as cellular components, such as DNA either from dead cells or microbes and proteins, have also been found within these pathological biominerals (which are also called microcalcifications). "The correlation of the composition of biominerals with pathogeneses of tissues has not been investigated systematically," Dr. Bingbing Sun, a postdoctoral researcher at the David Geffen School of Medicine, UCLA, tells Nanowerk. "We therefore set out to examine how the composition of biominerals correlates with the production of inflammatory cytokines associated with the stimulation of intracellular DNA sensors and by biominerals themselves." Sun, together with Hong Shen, previously an assistant professor at the University of Washington, now CEO of Elsa Biologics, LLC, have published a paper in Biomaterials ("Correlation of the composition of biominerals with their ability of stimulating intracellular DNA sensors and inflammatory cytokines") where they examine how the composition of biominerals correlates with the production of inflammatory cytokines associated with the stimulation of intracellular DNA sensors and by biominerals themselves. A core finding of this study is that biominerals themselves may stimulate NALP3 inflammasomes (an intracellular protein complex assembled upon stimulation), and DNA delivered by biominerals can potentially engage with intracellular DNA sensors (e.g., DAI and AIM2 inflammasomes), resulting in unwanted inflammatory responses. 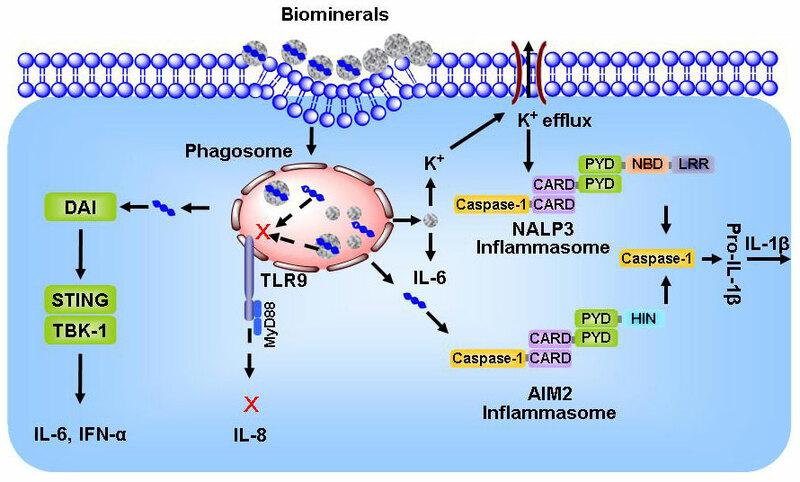 In particular, biominerals such as hydroxyapatite crystals can engage the NALP3 inflammasome and lead to the secretion of interleukin-1β (IL-1β). IL-1β is a pro-inflammatory cytokine that is responsible for a diverse array of injuries and infections, and has been recognized as one of the primary causes of inflammation. The study also shows that the level of both IL-1β and IL-6 is correlated with the composition of biominerals, in particular the ratio of Mg(Sr) to Ca, and the pH sensitivity of biominerals. "Understanding the interaction of biominerals with both molecular and cellular components within the innate immune system will be critical for elucidating mechanisms of biomineral-associated pathogeneses and implant rejections as well as for designing safer and effective DNA delivery systems and biocompatible tissue implants," Sun notes. The team's findings provide insights into the design of safe and effective DNA delivery systems and biocompatible implants as well as the understanding of the pathogeneses of biominerals deposited in soft tissues. "Our study presents a novel material design principle for both tissue engineering and gene delivery – gene therapy and DNA vaccine – by biominerals in clinical applications," says Sun. "For example, for tissue engineering and gene therapy, a low level of immunogenicity is preferred; while for DNA vaccines, the stimulation of innate immunity is beneficial for the induction and maintenance of adaptive immunity. Thus, the design of biomaterials for specific application will rely on the results of this study." Besides the intracellular DNA sensor and inflammatory cytokines examined in this study, other unidentified signal pathways may be involved during the interaction of biomaterials with cells. The researchers point out that further studies are needed to elucidate other possible signaling pathways. The challenge is these signaling pathways may not work independently, thus proper choice of model materials and cell lines are critical. In vitro validation using appropriate animal models is also necessary.